Fresh plums are available from late spring through summer. You will find these juicy fruits in an assortment of colors, from yellow and green to deep pink, purple and scarlet. Check out the varieties at your local farmers’ market, and choose a firm, fragrant fruit with sweet, tangy flesh (such as Simka, Santa Rosa, Seneca or Satsuma). The small, oval, purple-skinned, golden-fleshed plums known as Italian, French or prune plums will also make a delicious pie. 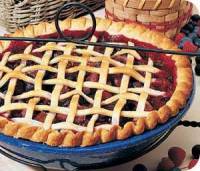 You can make this wonderful plum pie with a regular top crust or do a lattice type top crust. Either way, it's going to be delicious. In a small bowl, stir together the sugar, cornstarch, cinnamon and salt. Set aside. Place the plums in a large bowl, sprinkle with the sugar mixture and toss to distribute evenly. Immediately transfer to a 10-inch ceramic or glass deep-dish pie dish. Dot with the butter. Carefully position the dough round over the plums. Trim the edge neatly, leaving 1 inch of overhang, then place over the fruit, folding the overhang under and pressing against the sides of the dish to seal. Using a small, sharp knife, cut 5 or 6 slits in the top crust to allow steam to escape during baking. Refrigerate the pie until the dough is firm, 20 to 30 minutes. Meanwhile, position a rack in the lower third of an oven and preheat to 375° F (190 °C). Bake the pie for 15 minutes. Reduce the oven temperature to 350°F (180°c) and continue to bake until the crust is golden and the filling is thick and bubbling, 50 to 60 minutes more. Transfer to a wire rack and let cool completely. Serve at room temperature or rewarm in a 350°F (180°C) oven for 10 to 15 minutes just before serving.